« JMC Capital Partners Acquires Data Ltd. Inc. 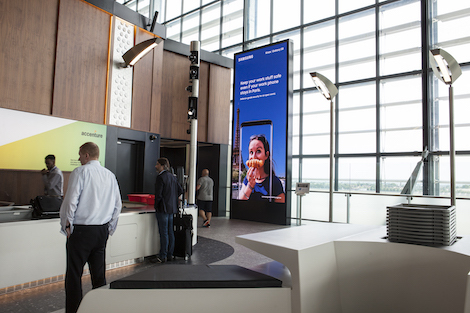 This week Samsung became the launch partner on London Heathrow’s most recent exclusive large format digital opportunity, namely The Golden Gateway. The Golden Gateway is situated at the entrance to First Wing and the striking six meter high totem dominates the beginning of the route through to the British Airways First Class lounge – it’s therefore pretty unmissable to 100% of this hugely influential audience. The prestigious site offers premium brands a truly unique platform to immerse, engage and influence the world’s elite thanks to its exclusive location. Up to 2,000 influential passengers pass through the exclusive security route every day, including British Airways First Class ticket holders, Gold Card members and their guests. The campaign booked by Cheil through JCDecaux Airport enhances Samsung’s presence in Terminal 5 where there is also complementary copy running on the T5 runway banners. This entry was posted on Wednesday, July 26th, 2017 at 15:53 @703 and is filed under DailyDOOH Update. You can follow any responses to this entry through the RSS 2.0 feed. You can leave a response, or trackback from your own site.